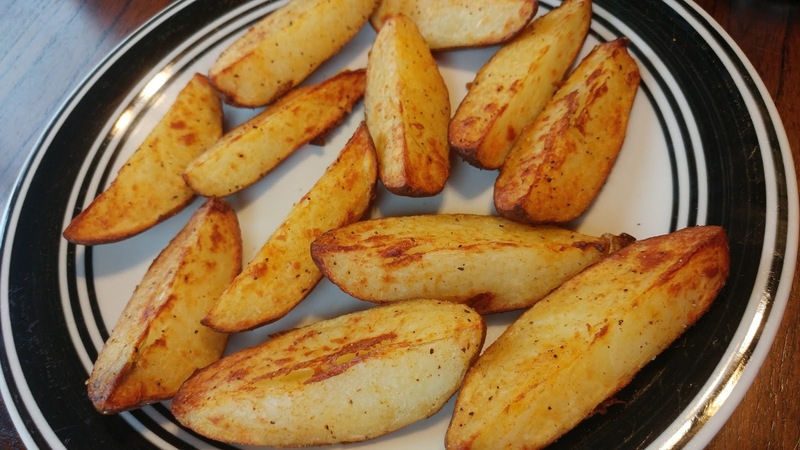 I love cooking with my pressure cooker and air fryer, and I love crispy potato wedges. My husband and I received an air fryer for Christmas from my mom, and potato wedges were the first thing I made in it. I choose to ALWAYS do a double cook on fries and potato wedges. The reason is I need that crispy and flavorful outside and creamy inside, I feel single cook doesn’t accomplish this. In restaurants (and in many recipes) they recommend 2 or 3 rounds of cooking at varying temperatures to achieve this effect, usually by deep frying. This is cooking the potato until it reaches the desired creamy texture internally, then cooking it again at a higher temperature so the outside gets it’s desired crispy texture (similar technique and idea with chicken wings). When you buy frozen french fries or potato wedges, they have already partially cooked the product for you (often blanched and then fried), as part of their process. You could just cut up the potato and try air frying it without additional steps and might get a reasonable result. But I don’t think it’s quite the result I want (it tends to be tough on the outside before potato cooked all the way through). It’s completely worth it to take a couple extra steps. I cooked whole potatoes until fork tender. I used my electric pressure cooker, on high pressure for 5 mins for this (natural pressure release), but boiling them stove top works as well. Once fork tender, put them in the refrigerator. The potatoes need to be completely cold before cutting. Next, the whole potatoes get quartered into wedges. I lightly oiled the wedges and seasoned (I used salt, pepper, onion powder, garlic powder, and smoked paprika… But creole seasoning mix worked great too) before putting in my air fryer basket, skin side down. I was able to get 3 whole russet potatoes, once quartered, into my air fryer basket. I cooked them in the air fryer at 400F for 13-15 minutes (or until they reach desired browning and crispy surface). You will probably need to let them sit for a couple of minutes, so you don’t burn your mouth. Your mouth will be rewarded. Have fun and get creative with your seasonings! I love cooking with my pressure cooker and air fryer, and I love potatoes. I choose to ALWAYS do a double cook on fries and potato wedges. The reason is I need that crispy outside and creamy inside, I feel single cook doesn't accomplish this. It's completely worth it to take a couple extra steps. Place trivet/rack into bottom of electric pressure cooker's inner pot. Add desired amount of potatoes, not to exceed max fill line. Add one cup of water. Place inner pot into electric pressure cooker device, and close lid. Cook on high pressure for 5 minutes, with natural pressure release. Once depressurized, remove potatoes from moist environment, and put in refrigerator until cold (about an hour). When ready to cook, quarter the potatoes (length wise) and toss with oil. I was able to cook 3 whole russet potatoes per batch in my air fryer*. 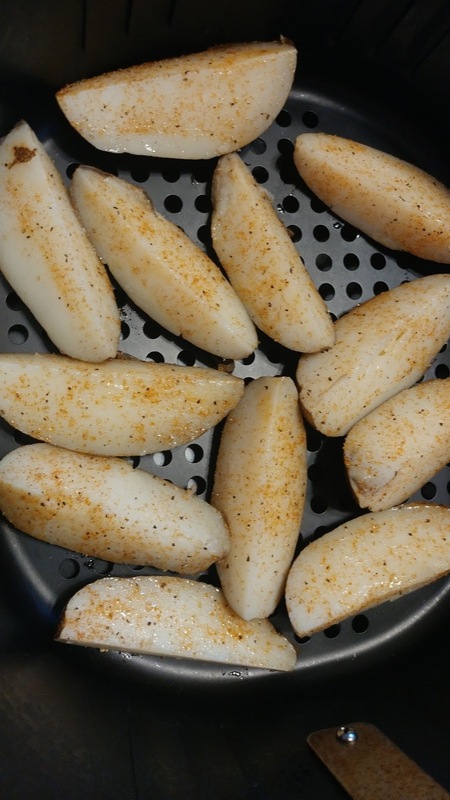 Place wedges in air fryer basket, sprinkle with salt and seasonings of choice. Air fry at 400F for 12-15 minutes, or until desired browning and crispiness is achieved. Allow to cool for a couple of minutes before eating. I didn't use specific amounts for potatoes or oil/seasonings. I fill up to max line in pressure cooker, and use the same times regardless of amount of potatoes. Just keep them whole until fully chilled. When coating with oil and seasoning, just go for an even coating and try new things. This is one of those recipes you don't need to be exact on. Have fun and get creative with your seasonings! Pressure cookers used/tested: both Instant Pot 6/8 quarts and 12 quart GoWise used for recipe. Air fryer used/tested: 5.8 quart GoWise used for recipe.